"The Entire Democratic Party Is Trash"
Yes, you say. We already knew this. But what’s entertaining about the above is it’s copied from a headline of a post at The Root, a black-focused website, discussing the latest, and one would think last, dying breath of the Doug Jones campaign in Alabama – which most would say is also trash. Democratic Rep. Terri Sewell (Ala.) dodged a question Sunday on whether she believed the racially insensitive mailer released by Alabama Democratic Senate candidate Doug Jones’ campaign was wrong, but then later admitted that it was a mistake. 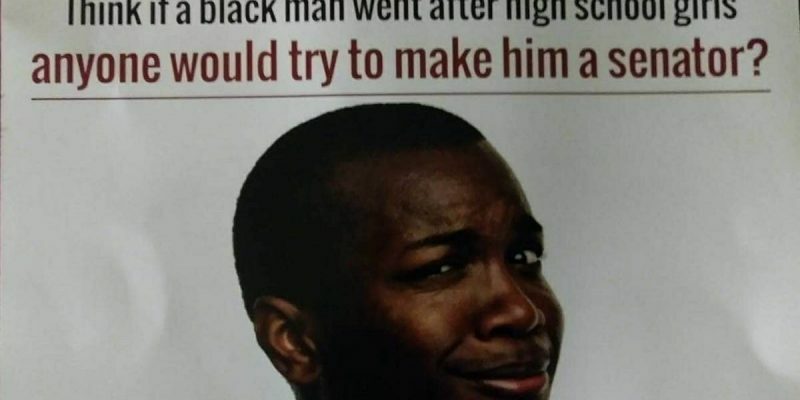 “Think if a black man went after high school girls anyone would try to make him a Senator?” the mailer read. Vice News reporter Alexandra Jaffe posted a picture of the mailer on Twitter. Why is this a mess? Why does it make “trash” of the Democratic Party? Until the stories surfaced about Roy Moore’s predilection for prepubescent ponytail wearers, the Democratic Party had wholly abandoned Alabama. It treated minorities and Democratic-leaning whites in the South like every black character in horror movies: necessary casualties left behind for the greater good. The party only campaigns in already-Democratic strongholds for the scant few electoral votes during presidential elections, and the rest of the time it ignores them completely. The rest of Harriot’s piece is a descent into the same post-2016 harangue about how Republicans are white supremacists and so on, but he does make the point that lazy messaging like that of what’s on Jones’ mailer is a pretty good avatar for why the Democrats have lost Middle America and can’t win elections outside of safe districts (there’s a lot of talk about a resurgence for that party due to Trump’s unpopularity; none of that has shown up in any major elections outside of the Virginia gubernatorial race, and Virginia is a pretty safe blue state now anyway). The problem with Harriot’s reasoning, though in the main he’s likely correct, is that until black voters actively turn away from Democrats as punishment for being patronized to in this way, the patronizing won’t stop. And while Jones is likely headed for a loss in tomorrow’s election – the RealClear Politics average has him down 2.5 points as of today and save for a Fox News poll that came out this morning which has Jones with a 50-40 lead and appears to be a serious outlier, Moore has been ahead in every poll since the end of November – there is no serious expectation on anyone’s part that Jones won’t get 90 percent of the black vote or more. And unless black people start putting their votes up for grabs and demanding results from the people they vote for – which includes giving credit to Republicans when the black community happens to benefit from Republican governance – nothing is going to change. Harriot might understand this, but only within the context of being a voter who’ll never stray from the “trash” party no matter how much he might despise it, and that means he’s screaming in a vacuum. As for the GOP, it’s better than the Democrats – but only slightly. Trump might be unpopular but he’s schooling his party’s establishment on how to fulfill promises it’s made for decades, and you’d think that record would make them see him as an asset. Instead, they’re finding ways not to include a legislative record to go with his executive actions and foreign policy success, and in so doing missing a major opportunity to change the country in a way which would all but finish the Democrats off. Voters in Alabama apparently see this, which is why Moore, whose social positions aren’t exactly in vogue and who’s rather alarmingly prone to making gaffes, looks destined for a seat in the Senate following a host of allegations we’ve already discussed which almost veryone though would kill his campaign. He beat the establishment Republican in the race despite Luther Strange having all the advantages, and he’s surviving those allegations against Jones, for the simple reason that those voters want that agenda passed and they see Moore as a man who’ll deliver them. Harriot does get this. What he doesn’t get is that the agenda which he disparages as white supremacist actually delivers better results for the black community than anything the Democrats have on offer. And while that might precipitate a round of head-shaking by conservatives of all colors, if nothing else we can derive some amusement from the crashing and burning of the “trash” Jones campaign.